I absolutely adore Sara Gleason of Plant Your Story. Her designs are some of the most beautiful I’ve seen and she is a true story teller! She also believes that each and every one of us has a story to tell, and one that is worth telling. She is such a wonderful source of inspiration!! She is currently doing daily prompts on her Facebook Page and her Instagram that I have been following and that I have decided might be a good jumping off point to get me writing on this blog more regularly! Today’s prompt is I want less…. I don’t really need to follow that up with anything! I just want less…mostly stuff! It’s getting to be the time of year when my home really starts to get on my nerves. I need to clean and clean out. Closets are jam packed, cabinets and drawers are an absolute mess, and everything seems to be weighing down on me. I am in need of some serious declutter time. I usually wait until summer, but this year, I just have an overwhelming need to start tackling things. I have also been following Landeelu on Instagram and I adore her decluttering and organizational strategies. She even has an Email Series on decluttering, as well as a Facebook Group – Clear the Clutter and Breathe. It has all been really inspirational for me and I’m hoping that I find some time soon to tackle at least one small project!! When I first read this prompt, I was thinking I needed something deep or philosophical, but nope, not this time. I just need less stuff. That’s what’s on my mind most of all. Maybe I will even document my progress, we’ll see. Wow, I didn’t actually realize how long it had been since I posted here. I honestly think the whole month of December was a blur! I have thought about it quite a bit, just never made the commitment to sit down and post. I’ve spent the last day or so reorganizing everything, creating new pages for the new year and coming up with ideas to get me posting here more often. We’ll see if it sticks! I finished up my Life in Pockets for 2017 and you can see it all HERE. Well, all but one week I am finishing up. I’m not sure why I got stuck on that week, but I’ll insert it when it’s done. I also started my Life in Pockets for 2018. I have the cover done and will start on pages next weekend. I’m excited for a new year. I also started and finished Document Your December for 2017 and you can see that HERE. I only went through the 25th because honestly we haven’t done a whole lot since then. I’m not going back and add all the layouts I’ve done in December. I’m just far too lazy. But I hope to keep up better from now on. I plan to add the blog to my list of layout upload places and that should make it easier :). And if you’re looking for some excitement – It’s MOC time at The Lilypad! 31 days, 31 challenges! If you complete them all you get a $20 gift certificate to The Lilypad and a chance at a Polly spot! It’s a sweet gig, I tell ya! Under my scrap pages, I added a section just for my MOC layouts! I love participating and stretching myself out of my comfort zone! It’s always exciting to see the challenges pop up every day! If you haven’t signed up, you really should! It’ll be fun, I promise! It’s that time of year! My very favorite smell is in the air. The honeysuckle is in bloom and my yard is full of it. Just walking outside makes me smile. It brings back so many childhood memories of taking walks, picking the blooms and tasting the sweet stuff inside. I googled it and there are even youtube videos showing the proper way to eat honeysuckle! 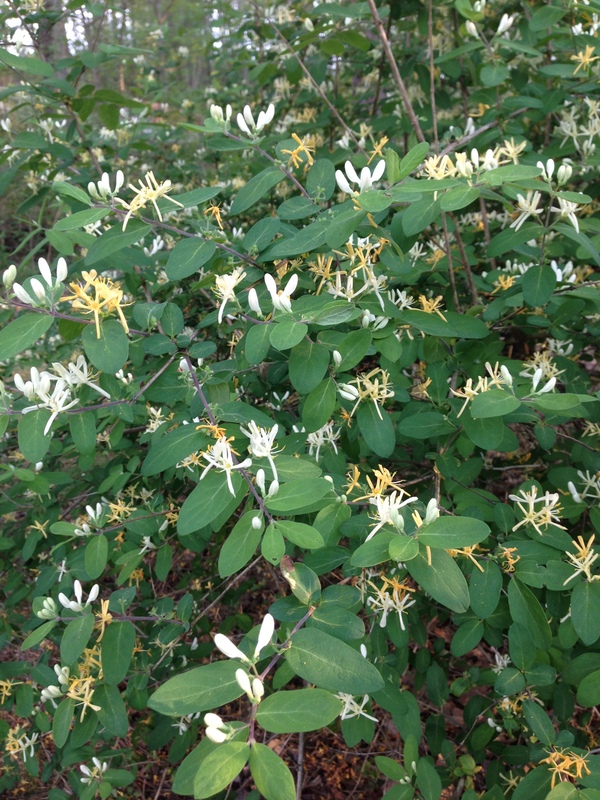 If you’ve never tried it, and happen across a honeysuckle bush, try it…you’ll like it! I love taking my children and showing them out to eat it, as well. Sharing a bit of a simpler time. The road to our house is lined with with it for miles and I love to ride with the windows down and just breathe. So yeah, just a random post to share my love of honeysuckle. It never stays around long enough. I just need to decide on paint color and cushions. I think it will be perfect for this house. I will be sure and update with progress. I may even try to photograph the process. We are planning a date now to go and dig through the pallets and find the perfect ones! Wish me luck!! I might just feel caught up on the last day of school, but probably not. 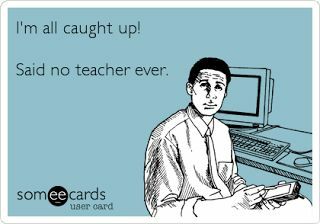 IEP season is upon us and that takes up about every spare minute I have. This is the time of year that I go through what I need to do all day and count down the days until the end. Only add a little panic in there when I think of all I have to do in the days that are left.But like I always say, it will get done. And then I spend the evenings in my scrapbooking and trying not to think about all the stuff I will have to do the next day. I’m off now to get lost in scrappy stuff and I’ll come back tomorrow to share. There’s some pretty cool stuff coming! Hope everyone had a wonderful Easter weekend. Mine was spent with children off and on over the last couple of days. We had dinner Saturday with A, his GF, and daughter here at the house. They had to spend Sunday packing for their trip to Disney. I think they left about 3:30 this morning and I didn’t have time to stuff myself in their bags *sniff*. I’m sure they will have a great time! Yesterday was dinner again with M and her BF, and then once again using my precious Silhouette Cameo to make vinyl decals for their cars. Maybe one day I will get to use it for my crafty stuff! C had his visit from the “creepy bunny”, but creepy or not, he was thrilled with the Playstation gift card so that he can finally buy that Minecraft skin pack he’s been wanting for weeks. My favorite part of the weekend was being able to get outside and work and play in the yard. The weather is fabulous and we so deserve it after the long awful winter. One of these days, I am moving away from winter! I was also able to get some pretty good photos and can get by PL updated for this past week. Sometimes life seems so monotonous and I go days without a photo. But I really enjoy keeping up with life weekly and the family loves to look back at the one I did last year and see what was going on and when. I’m really getting in to the whole pocket scrapbooking trend and am a bit obsessed with journal cards at the moment. I grab all that I can get my hands on! Danyale of Etc by Danyale is hosting a challenge this month in her Facebook Group – Etc Pocket Page Group – where she is giving away journal cards and selecting winners from each week’s challenge. It’s a fun way to play around with Pocket Pages and win $10 to her shop! So, if you are at all interested, come join and give it a go! I’m also really enjoying looking around at The Pocket Source. Talk about some fantastic inspiration. I’m headed out now to enjoy some more sunshine and possibly getting in to something crafty. I am having a really hard time finding cushions to fit my deck chairs, so I am thinking MAKE THEM! Have a great Monday! So, I’m running a bit behind this week and playing catch up! I just added my newest scrap pages and updated my PL page….for last week! I’ll have a new batch of pages and stuff as soon as I get them loaded in to galleries tomorrow 🙂 And I’m getting ready to work on PL for this week. We had a day off today, but not for snow this time. We got pounded by rain yesterday and add that to the bunch of snow we had melting and you get lots of flooding. The county where I work is worse off than we are but it’s been pretty bad everywhere. It took me a couple of hours just to wind my way around town to get to the bank and home yesterday. Then we got held up by rescuers getting a lady and her son to ended up in the creek and got swept down til they got stuck on an bridge. They were ok. I had a hair appt today, so we drove 20 miles to find out that my stylist got flooded and no one called me to cancel the appt. So we got take out and just came right back home. I was bummed. Now I’m rescheduled for Tuesday after school. I’ll be back to update all the goodies for this week. Hope everyone has a great weekend! !